Spain’s Rafael Nadal reacts after a point against Bulgaria’s Grigor Dimitrov during their men’s singles semifinal match on Friday. 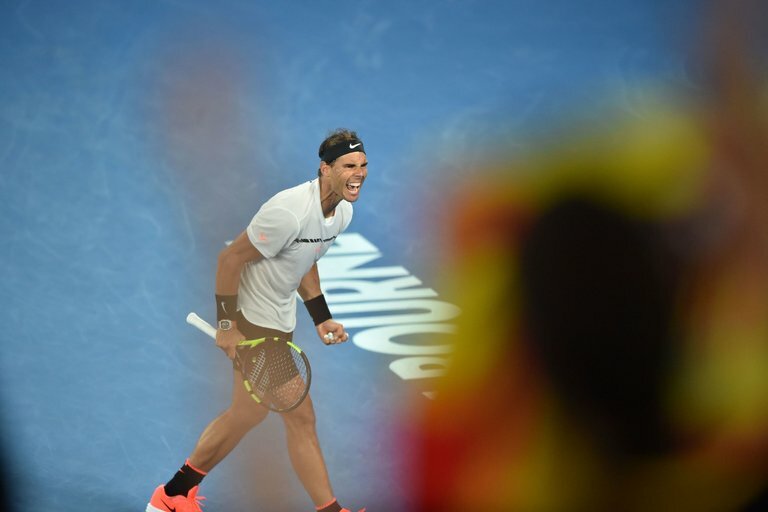 MELBOURNE, Australia — Rafael Nadal completed a slate of throwback singles finals at the Australian Open, beating Grigor Dimitrov, 6-3, 5-7, 7-6 (5), 6-7 (4), 6-4, in a battle of 4 hours 56 minutes that started Friday evening and ended at 12:44 Saturday morning. In Sunday’s final, Nadal, 30, will face his longtime rival Roger Federer, 35, a nostalgic counterpoint to the women’s championship match between Venus Williams, 36, and Serena Williams, 35. Nadal and Federer have not met in a Grand Slam final since the 2011 French Open. Against Dimitrov, Nadal saved three break points in a tightly fought fifth set, including two at 3-4. He earned the crucial break in the next game to go up 5-4 and serve for the match. On Nadal’s third match point, Dimitrov’s final backhand landed long to end a 13-shot rally, and Nadal fell to the ground in relief. That last point was emblematic of how the ninth-seeded Nadal managed to outlast the 15th-seeded Dimitrov, time and again showing his superior physicality in the longest exchanges. The two were more evenly matched on shorter points, but of the 64 points that lasted nine or more shots, Nadal won 39. Dimitrov, 25, had reached only one previous Grand Slam semifinal, at Wimbledon in 2014, but he rarely seemed daunted by the occasion. Already 10-0 to start the year and a title in Brisbane to his name, Dimitrov frequently displayed improved power and consistency in the match, even as it wore on into the fifth set, striking 79 winners to 45 for Nadal. But he could not match Nadal’s ability to turn defense into offense; few can. Dimitrov’s one-handed backhand was particularly exposed by Nadal’s attacks and counted for the majority of his forced and unforced errors. Nadal, a 14-time major champion, last reached a Grand Slam final at the 2014 French Open, which he won. He last reached a final in Melbourne earlier that year, losing to Stan Wawrinka. Nadal has missed large stretches of competition in recent years because of various injuries, including a wrist ailment that forced him out of the French Open and Wimbledon last year. Sunday’s match will be the ninth Grand Slam final between Federer and Nadal, and their second here. In their previous one in 2009, Nadal beat Federer, 7-5, 3-6, 7-6 (3), 3-6, 6-2, a match perhaps best remembered for Federer’s tearful runner-up speech in the trophy ceremony. That final was also preceded by an epic semifinal for Nadal, who needed 5 hours 14 minutes to put away Fernando Verdasco in five sets. Federer, the No. 17 seed, needed five sets Thursday to take his semifinal against Wawrinka, but that match was nearly two hours shorter than Nadal’s win Friday. Nadal has won 23 of 34 matches against Federer, and 9 of 11 meetings at Grand Slam events. Nadal’s 14 Grand Slam titles is second among active players, behind Federer’s 17. An earlier version of this article misstated the date of the last Australian Open Final Rafael Nadal played in. It was 2014, not 2012.